An alkyd is a polyester modified by the addition of fatty acids and other components. They are derived from polyols and a dicarboxylic acid or carboxylic acid anhydride. Alkyds are used in paints and in molds for casting. Higher quality higher performance alkyds are produced in the fatty acid process where the composition of the resulting resin can be more precisely controlled. 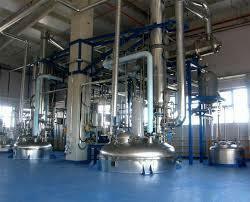 Alkyd coatings are produced in two processes; fatty acid process and the alcoholysis or glyceride process. They are the dominant resin or "binder" in most commercial "oil-based" coatings. More economical alkyd resins are produced from the alcoholysis or glyceride process where end product quality control is not as paramount. In this process raw vegetable oil, high in unsaturated component, is combined with additional polyol and heated to cause trans-esterification of the triglycerides into a mixture of mono- and diglyceride oils. We offer our clients a wide range of Alkyd Resin Plants. Based on our vast experience, we have been able to comprehend the minutest needs of our clients. Our constant endeavors to offer our clients with best services and products have been appreciated by our clients and helped us in building a positive brand image. We provide assistance to our clients in making the correct choice based on their budget and attempt to meet their requirements on time. Our professional attitude and valuable and efficient services have helped us garner a wide client.